There is a lot happening in the Pittsburgh filmmaking scene. We aren’t just talking about the big films – yes Tom Cruise has been in town. But there are lots of smaller projects happening here too. This Saturday, December 3 there will be a screening of four short films by Pittsburgh filmmakers the event is titled A Night of Altered Reality and will be held at the Hollywood Theater in Dormont. I first learned about the film, Lightweight, from the Steeltown Film Factory competition and it is exciting to see the finished film. The Steeltown Film Factory is an annual competition that is open to anyone – the submission period for the 2012 contest is now open. 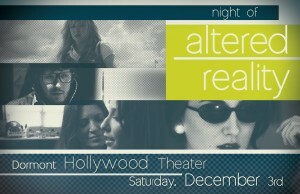 A Night of Altered Reality, a screening of short films that intersect at the corner of Surreal Street and Dream Drive.